Active volcano, erupted for about a hundred times. ash column over Tierra mountain climb to a height of 3000 m. The last significant eruption was recorded in 2014, then killed about two dozen local residents. Smoke can often be seen emerging from the mountaintop, and several eruptions have caused fatalities. Pyroclastic flow from a large explosion killed 27 people on 22 November 1994, mostly in the town of Muntilan, west of the volcano. Another large eruption occurred in 2006, shortly before the Yogyakarta earthquake. In light of the hazards that Merapi poses to populated areas, it has been designated as one of the Decade Volcanoes. On 25 October 2010 the Indonesian government raised the alert for Mount Merapi to its highest level and warned villagers in threatened areas to move to safer ground. People living within the range of a 20 km (12 mi) zone were told to evacuate. Officials said about 500 volcanic earthquakes had been recorded on the mountain over the weekend of 23–24 October, and that the magma had risen to about 1 kilometre (3,300 ft) below the surface due to the seismic activity. 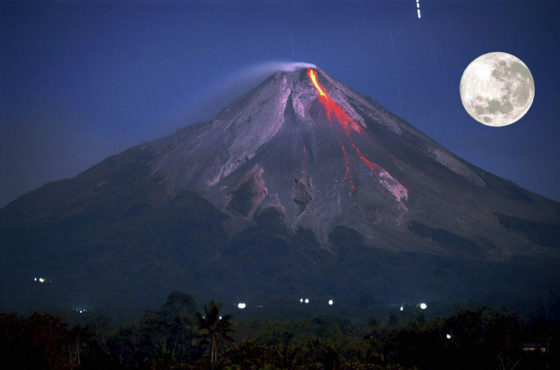 On the afternoon of 25 October 2010 Mount Merapi erupted lava from its southern and southeastern slopes.